Production version of the Speedster will be unveiled next week. Porsche is set to bring back one of its most well-known 911 variants, the Speedster. The German Automaker revealed a silver concept version of the car last year, which was later followed up by a more production-ready red car at the 2018 Paris Motor Show. Since then we've only seen test mules of the Speedster lapping the Nurburgring, with no confirmation of when the production car would make its debut - until now. Thanks to an anonymous tip from a Speedster customer, we now know that the car is set to make its debut next week at the 2019 New York Auto Show. The source sent CarBuzz a copy of their invite to a charity cocktail party on April 18 "for the unveiling of the new 911 Speedster." We suspect that the car will make an appearance during the press days on April 16 and 17 and there's a chance Porsche will reveal the car online in the next few days. Only 1,948 911 Speedsters will be built, so getting on the list to buy one likely wasn't easy. Unlike the 2011 911 Speedster based on the 997-generation Carrera S, this new model will borrow its drivetrain from the 991.2 GT3. 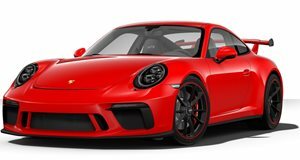 This means it will utilize a 4.0-liter naturally aspirated flat-six producing 500 horsepower going out to a six-speed manual or seven-speed PDK transmission. We still don't know whether the car pictured in the invite is the production car, or simply the red concept shown in Paris. If this is the production car, we are surprised to see elements like the hood-mounted gas cap and throwback side mirrors make production. Porsche did say it wanted the production version to remain close to the concept, so we'd say job well done. We don't have any word on pricing but we know all 1,948 cars are spoken for. If you want one, you'll have to pay a hefty premium to pry it out of the hands of another owner.